Although the shortest distance between Africa and Europe is only 14 kilometers, but the Mediterranean Sea has prevented the two continents to unite. But, in 1928, a German architect proposed a plan called Atlantropa, ie a controversial plan that is intended to drain the Mediterranean Sea and create 'Eurafrican supercontinent'. Although this proposal may sound ridiculous now (as when Sörgel first proposed), but it was taken seriously by architects, engineers, politicians and even the journalists. Maybe it sounds strange, the plan was taken seriously by several head of states, and even the United Nations (UN) in that time. the person behind the great idea. Yes, a German architect named Herman Sörgel was the person behind this great idea, hoping this colossal plan will be the answer to the refugee crisis of Europe after World War I and helped bring world peace. 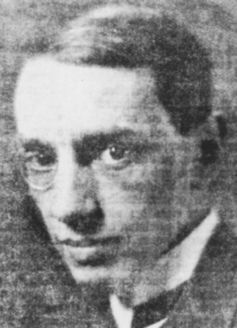 The idea continues echoed by Sörgel from 1928 up to his death in 1952. As qouted an article published in The Conversation, Dr. Ricarda Vidal, a lecturer in Visual Culture and Cultural History at King's College London said, "The experience of World War I, economic and political turmoil of the 1920s and the rise of Nazism in Germany assured Sörgel that the new world war can only be avoided if a radical solution is found. With a bit of confidence in politics, Sörgel turned to technology." 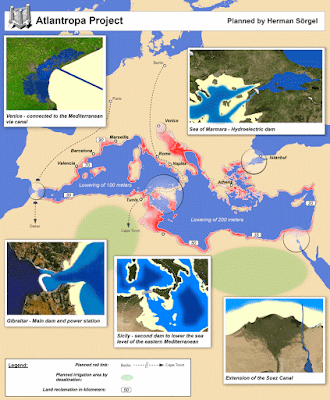 The foundation for building a supercontinent that is to set up the dams along the Strait of Gibraltar, the Dardanelles, and ends between Sicily and Tunisia. Each contains a giant hydroelectric plant. He believes that this will transform the Mediterranean into two basins, the western part is lowered by 100 meters and 200 meters on the east part. This will provide a new land with a total area of ​​660,200 square kilometers by reclaiming the sea. The new land is even greater than the area of ​​France reached 640,679 square kilometers. Dr. Vidal said, "Additional plans for Atlantropa also included the construction of two dams on the Congo River and creation of the sea of Chad and Congo, which Sörgel hope will have a moderating influence on the climate of Africa so that makes it more fun to European settlers." "What makes this Atlantropa so interesting, the vision of world peace is achieved not through politics and diplomacy, but with a simple technology solution," said Dr. Vidal. Atlantropa will be controlled by an independent body that would have the power to shut off energy supplies to any country that becomes a threat. And Sörgel said, by building the supercontinent would make countries in Europe don't have enough money to pay for the war. He then dedicates most of his time to promote his ideas, including through radio programs, films, talks and even the Atlantropa symphony. In 1948, the UN World, a New York-based magazine wrote, 'By utilizing Gibraltar to the mankind does not sound like a dream. But in the 20th century was no dream (even cooperation between countries) are not possible (realized).' Unfortunately, the Sörgel plan not running, while until now the Africa continent and Europe remains a continent apart. Is the plan still relevant today?